Detailed review of Prescript Assist Broad Spectrum Probiotic & Prebiotic Complex. See how this probiotic supplement compares against all the others! ***2018 Update*** This product has been pulled off the market due to some problems with the ingredients and/or manufacturer. We’re not exactly sure what’s going on, but we’d suggest avoiding this product for now. Overall, I gave Prescript Assist Probiotic a 3 out of 5 stars, making it slightly above average. Right away I was impressed with the 29-probiotic strains. This is definitely a higher strain count than your average probiotic and I did see some belly improvements while taking it. I like that this probiotic has a shelf life of 2+ years after the manufacture date. It also doesn’t have to be refrigerated before or after opening, which makes it much more stable in my opinion. I also like that this product uses probiotics and prebiotics. In addition to these, it also has a very short and more natural ingredient list. This is something I always appreciate. I like my products without a laundry list of added, weird ingredients. There are some things that I don’t like about Prescript Assist Probiotic. For starters, it’s incredibly expensive. At nearly $50 a bottle, you only get 60 capsules. This could last you as little as a month or up to two months (depending on if you take 1 or 2 daily). Something I found odd was that the bottle and website don’t clearly state how many live cells are present. This concerned me and it took a little bit of digging on their website to discover that each capsule has 145 million cells. I also got some side effects while first taking this probiotic, which I could’ve gladly done without. Overall, I gave it the 3 out of 5 stars because I liked the 29 strains, shelf life and more natural ingredients but didn’t like the high price, initial side effects, and lack of information on the bottle. Prescript Assist Probiotic has a proprietary blend of 145 million CFU’s per capsule in a 29-strain formula. Of note, I like the strain Bacillus subtilis, because it may have a unique ability to survive the body’s pH levels. It has been considered a very tough probiotic that may be able to keep itself alive. This makes it very resilient and more able to make its way into your intestinal tract so it can help you to start feeling better. Bacillus subtilis may also be able to help increase immune function and also help fight off urinary tract infections and digestive disorders. I also like the addition of Bacillus brevis to the strain profile. This strain may help balance out the good and bad bacteria within our body. Bacillus brevis may also help improve overall digestive function and immune function. Since it may do a good job in balancing out the microflora in the body, it may be a good strain choice after taking a round of antibiotics. This is because it might possibly help balance out the bacteria levels and get you back in line in terms of digestive functions. Prescript Assist Probiotic is gluten-free, dairy-free, and vegan. cellulose (vegetarian capsule), l-leucine, bamboo (Bambusa vulgaris) extract. For a 60-capsule bottle, it will cost you $49.00. When you break it down to a daily cost, it ends up being between $0.81 and $1.63 (very above average). I’m not entirely sure that this probiotic is worth the $49.00, even though I did see some improvement in my belly function while taking it. For the first 3 to 4 days of taking Prescript Assist Probiotic, I did get side effects. The website states that you may take the capsules with or without food and I tried both ways and still felt a little uneasy. I think the 29 strains of probiotics and prebiotics are pretty potent, even though there are only 145 million live cells. If you’ve never taken probiotics before, definitely be cautious and ease into this one. 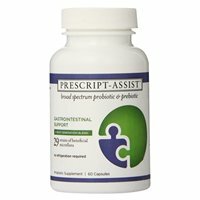 I didn’t find a satisfaction guarantee from the Prescript Assist Probiotic website. I was let down by this, because I really do like when companies can give you some sort of guarantee while trying out their products.